I’m a big fan of style. I like to be stylish, it’s true. But what I really mean is, I’m a great believer in the importance of aesthetics. Visual, textual, conceptual aesthetics; persuasion by elegance as well as argument. Recently, I started thinking about the importance of style when I was given a free cinema ticket to see The Black Power Mixtape. Goddamn, I thought as I watched, even if I’d been an apolitical black man in 1970s America (humour me), I’d probably have been a Black Panther anyway just for the outfits. 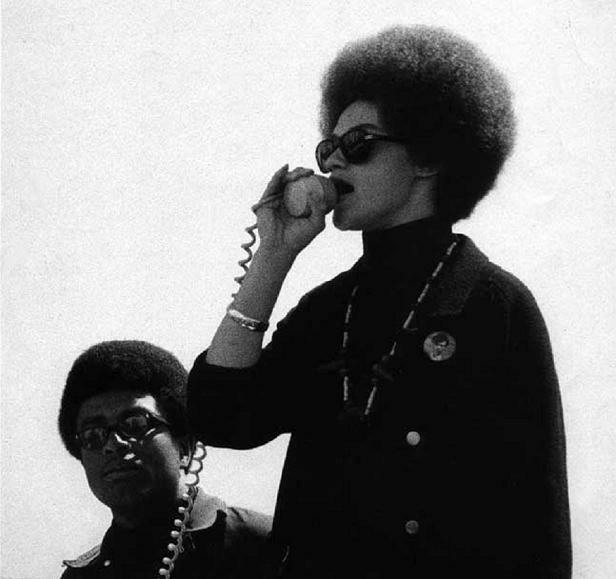 The film was brimming with footage of lean black men in leather jackets and berets, classrooms of kids chanting “Power to the people, right on”, and Angela Davis giving the most withering rebuttals you’ve ever heard, while shaking an afro as big as a bicycle wheel. Inspiring activist material. Right on. Style definitely has the power to turn people on to a movement. Anonymous, to take a current example, have got bags of style. They’ve got a cool logo. They’ve got cleverly edited, pop-culture-referencing video presentations. They’ve even got a mask taken from an Alan Moore comic book, FFS! As a movement, Anonymous has been very good at appealing to the kind of people who have a strong sense of political discontent, but are more attracted to slick production values and punchy aphorisms (“We are Legion. We do not forgive. We do not forget. Expect us…”) than hand-painted banners and debates on the precise terminology of anti-capitalism. It’s understandable. If there’s one area where capitalism excels, it’s providing us with a constant stream of new ways to spend our time and money. Shiny toys in shiny boxes, endless new trinkets or experiences to be bought. Which is why the excesses of consumer culture must be rejected, of course, but whatever alternative model we propose needs to be explicitly fun and colourful, because if it isn’t then where’s the attraction in the first place? Capitalism will not be overthrown by hemp and beige, it will be overthrown by hot pink and neon. Not specifically hot pink and neon, but you get the idea. This isn’t to rule out the need for dedication and sacrifice, which will be essential to systemic change, but just to say that we should keep the lighter side of anti-capitalism in focus. They didn’t call it the Communist Party for nothing, right? Once upon a time, I had the good fortune to live in Paris. When I was there I lost count of how many exhibitions I saw exploring some aspect of the May ’68 student movement. Its memory still permeates contemporary French culture, a celebrated and mythologised past that remains very much alive in the present. But instead of just focusing on the political ramifications of the movement, many of the exhibitions explored its visual legacy: the distinctive pamphlets and block-printed posters, or collections of street photography from the time, black and white images of stoic yet playful students occupying streets, theatres, universities, convinced they were on the cusp of a new social order. 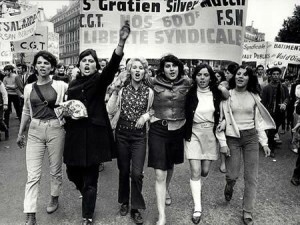 At the time, the spirit of radical freedom and rebellion translated into an unbridled output of creativity, and the movement would surely not hold the same allure for young French men and women today if it had not been so eminently photogenic. If the soixante-huitards were trying to embody the world they wanted, it was clear that this new world would be a stylish one. So far, the Occupy movement has made a few strong contributions in terms of slogans: the tagline “We are the 99 percent” is instantly recognisable, and the prefix ‘Occupy’ has become a great piece of activist shorthand: Occupy Wall Street; Occupy LSX; Occupy the Tundra; Occupy Everything. But considering how long it has been since the inception of the movement, it has yet to produce much in the way of striking imagery (besides the pepper spraying riot cop meme). Personally, I’d like to see a cohort of radical artists and designers get on board to produce some memorable artwork that could spread around the internet (possibly just what Occupy LSX is aiming for with its plan to crowdsource a new logo). Sure, it’s a global movement, and staggering in its diversity, but having a single banner to march under has a powerful unifying effect. Finally: let’s be clear, style can be a tool of revolution but fashion is counter-revolutionary. Style is a timeless, essential quality, while fashion is a transitory taste for styles which, of necessity, will change as rapidly as feasibly possible in order to maximise obsolescence. I should also point out here that I basically stole this philosophy from Bruce LaBruce, everyone’s favourite alt-gay-revolutionary-pornographer, because right now he’s owning the Venn-diagram space where fashion, sexuality and radical politics overlap. And on the subject or Mr LaBruce, you should all really read this because it’s my favourite ever revolutionary manifesto (sorry Karl). LONG LIVE THE PURPLE RESISTANCE ARMY! We can doubt his revolutionary credentials in his later years and equally disagree with his politics but Yasser Arafat’s style definetly contributed to the appeal of the Palestinian cause. Tell me that isnt cool. The keffieh for me, perfectly sumps up the relationship between style and revolution. Equally look at Castro, Che, Camilo and the July 26th Movement, there style (cigars, bereys, beards etc.) definetly helpd spread the appeal of the Cuban revolution.